Learning to Save Money on Almost Everything, Especially at Christmas Time! Financially,�times are tough. Everywhere you look, stores are closing, prices are rising, and�great deals�are getting harder and harder to find. We here at�Econobusters�understand everyone�needs�a helping hand. That�s one of our main principles, everyone working together to bust through these hard economic times! Search the weekly ads and use�coupons. Most grocery ads come out every Wednesday and retail ads come out on Sundays. The age of the giant Sunday�newspaper�full of ads and coupons has almost passed us by. Now days, you might find good�deals�in the Sundaypaper, but your best bet is to hit the web. One of the best ad websites for supermarkets and retail chains isSundaySaver.com.�They post links to almost all of the national chain stores. Have you read�The Coupon Craze: Chaos or Common Cents�issue ofMolly Green�Magazine? Check it out! Most coupon lovers are familiar with the� inserts found in the Sunday newspaper. The three main companies that provide these coupons�are�Smart Source,�Red Plum, and�Proctor & Gamble. All three companies also provide coupons online. Providing printable coupons on the Internet makes collecting and sharing coupons with others very�simple. In fact, one website,�Coupons.com,�usually hosts them all in one place. Create a monthly challenge. Each month, make it a goal to save more than the month before. Find ways to collect more coupons, stack more deals, and earn more�rebates. Over time, shoppers learn pricing and predict when items will go�on sale. Look for deals all year long:�garage sales,�thrift stores,�second hand stores,�Goodwill, and Salvation Army. You might begin by signing up for your local�Freecycle�group. Anytime you need something for yourself, the�home, or the�kids, ask your�Freecycle�group first. This is an easy way to receive TVs, electronics, small appliances, clothes, toys, and books. You can also list things you no longer need on this group! Speaking of books, we all know about�Amazon, but occasionally, you can find what you want for free on�Paperback Swap. You post the books you no longer want. Other people request those books from you. You mail a book to that person, (at your cost), and then you get to pick a book to be mailed to you! If the book you are looking for isn�t listed, check�Deal Oz. This website does the book searching for you and finds the best deals on the web for books, CDs and DVDs. Lastly, you might be interested in these points incentive programs:MyPoints,�Swagbucks, and Amazon. You can earn points toward freegift�cards simply by reading�MyPoints�daily emails, (no purchase required). If you use�Swagbucks�as your search engine, you also can earn points toward free gift cards, but it�s not as easy as MyPoints. Amazon has started a new incentive program where you agree to review products. If you are chosen. They send you the products free of charge to keep!!! It�s called the�Amazon Vine. Check it out! What great deals have you found that save�money, especially during the�holidays? You know spring is coming when you are surrounded by 8 new puppies, and kids that are in awe. �God does amazing things with puppies and kids. �My daughter so wanted to watch them be born, but as she saw the first one come out she saw the sack and screamed "ugh" . �After that she ran straight to her room, to stay until Abbey had to time to clean up the puppy before the next was born. To see pictures please come to my blog and have a look around. join me for a cup of coffee, or tea and look at my new additions to the family. After watching a program by Reb Bradley on The Homeschool Channel, I got inspired to create this wall of character. Although he didn't talk about this concept that I came up with, he did talk about particular ways in which they use scripture and certain questions around their home. After meditating on those things, I came up with our wall. The two questions listed at the top were two main guidelines that he talked about. Basically, they're based on the commands to love God and love your neighbor. 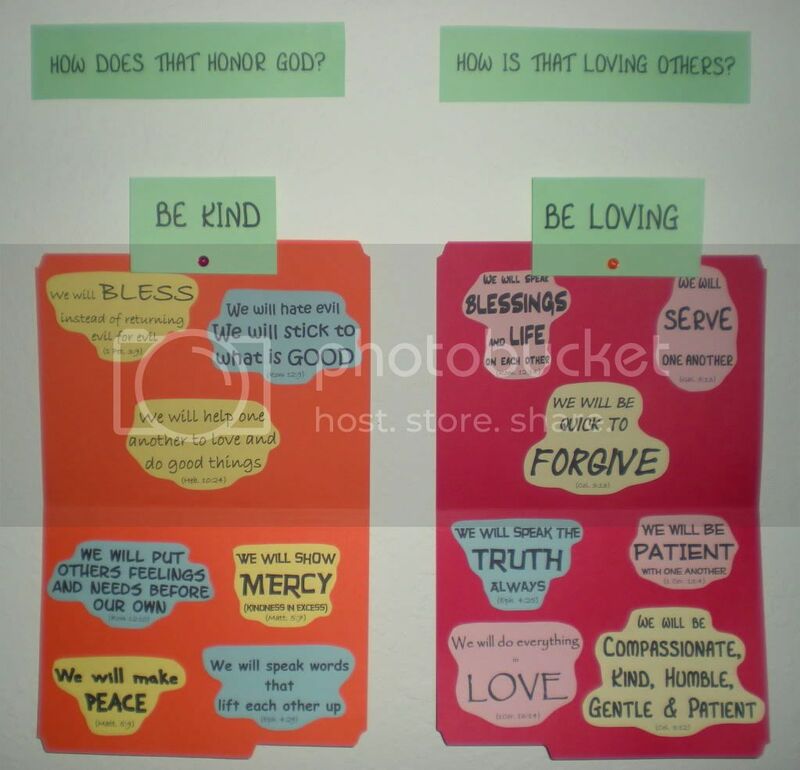 The two statements listed below that are two main principles that should always abound in our home (be kind, be loving). Reb talked about how as parents we can fall into a don't do this and don't do that christianity (i.e. don't lie, don't fight, etc.). He mentioned how they turn it around instead to be positive - this is what we do. So one night while spending time with the Lord, I gathered together a bunch of scriptures that pertain to how we should act and treat others. By no means is my list exhaustive, but it's a good start. From there I wrote positive statements from those scriptures and then referenced the scripture. Now, when one of my children break one of the commands, I walk them over to the wall and we start at the top by asking "What you just did, how does that honor God? ", and then the second question, "How is that loving others?". Then we find the statement that pertains to the offense, they profess what it says (i.e. We will speak the truth always) and then they must look up the scripture in the bible and read it to me. Since we've implemented this system, it has brought such a peace to our home and to me. Instead of getting frustrated and being tempted to yell or speak harshly to them, I simply say, come with me and we go through the steps. It's a great visual to what they've been hearing for so long. One quick testimony; last night something happened and one of our boys said, "I'll show mercy just like the thing says". We haven't even used that particular scripture since we put the display up, but he has been reading them and it has stuck with him. What a blessing that brought to my heart. Just one last detail. I ended up pasting the scriptures to the inside of file folders and now we can simply close them up and take them along with us throughout the day wherever we go. I didn't plan that but as I was being obedient to what I believed the Lord was telling me to do, everything just fell into place so nicely. He is so faithful to lead us and give us wisdom. All we need to do is ask.